Gherlenda, A.N., Esveld, J.L., Hall, A.A.G., Duursma, R.A. and Riegler, M. 2016. Boom and bust: rapid feedback responses between insect outbreak dynamics and canopy leaf area impacted by rainfall and CO2. Global Change Biology 22: 3632-3641. Writing as background for their work, Gherlenda et al. (2016) note that Australia has "a highly diverse endemic psyllid fauna, including many species associated with Eucalyptus (Hollis, 2004)." These small insects feed on plant leaves and can cause considerable damage to the host plant via defoliation and dieback if outbreaks are severe enough. However, much remains to be learned about how psyllids will respond to changes in climate and atmospheric CO2 that are projected to occur a few decades from now. Thus, it was the research objective of the five Australian scientists to quantify "population responses of three naturally occurring lerp-forming psyllid species within the Eucalyptus free-air CO2 enrichment (EucFACE) experiment, both at species and community scales, within the first 2 years of CO2 fumigation." The EucFACE experimental site is located in the Cumberland Plain Woodland in Richmond, NSW, Australia, where Eucalyptus tereticornis (the dominant tree species at the site) have been subjected to normal air or air enriched with an extra 150 ppm of CO2 since February of 2013. 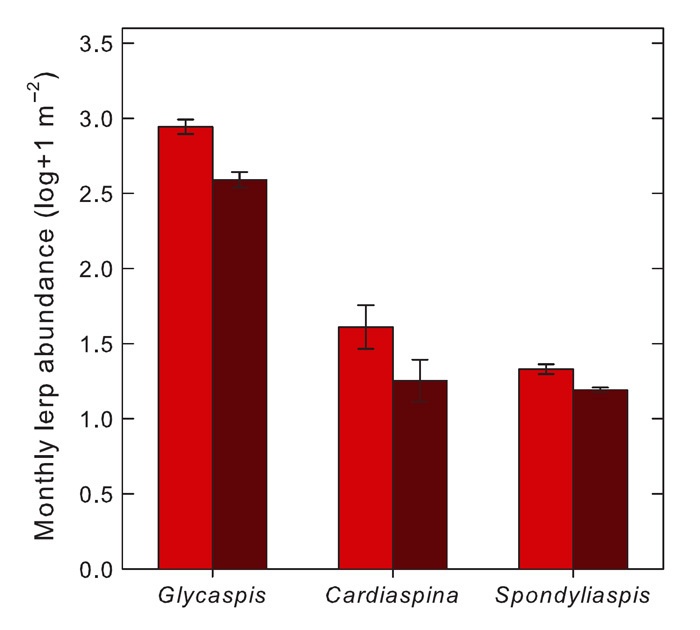 There, over a period of two years, the authors monitored the abundance of psyllids, grouping them according to three genera: Cardiaspina, Glycaspis and Spondyliaspis. In discussing their findings, Gherlenda et al. report that "elevated CO2 did not alter the outbreak potential and community compositional shifts of psyllid species at EucFACE, but it reduced abundances of psyllids by approximately 10-22% and therefore also modulated the population peaks." Such "negative response," in the words of the authors, "contradicted our expectation that plant sap feeders generally respond positively to elevated CO2." And thus we see yet another benefit of atmospheric CO2 enrichment on plants. Figure 1. Mean (± SE) lerp abundance of three psyllid species, Glycaspis sp., Cardiaspina fiscella and Spondyliaspis sp. collected at the EucFACE experimental site. Values are log-transformed. Bright red bars indicate ambient air treatment and dark red bars indicated elevated CO2 treatment. Source: Gherlenda et al. (2016). Hollis, D. 2004. Australian Psylloidea: Jumping Plantlice and Lerp Insects. Australian Biological Resources Study, Canberra, ACT.